It’s been almost five years since writer-director Jay Middaugh wrote the first draft of LIVE in Kingston, a feature comedy about the city’s downtown music scene. 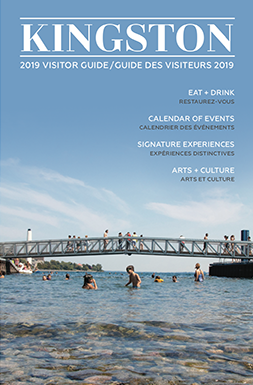 But this March his labour of love, entirely produced and sponsored by locals, will finally make its debut at the Kingston Canadian Film Festival (March 2 – 5). Following eternal grad student and college radio DJ Emily, the film’s action takes place between 12 live shows in 6 nights at iconic Kingston venues as Emily scrambles to save the radio station and earn her final credits. Featuring performances by Kingston favourites like Sarah Harmer, PS I Love You, Miss Emily, Lost Cousins, Forty Seven Teeth and many more, it should be a fitting homage to Kingston’s music scene and a rollicking celebration of local film, music and community. Crazy to think, though, that Middaugh, who also runs Kingston’s Sleeping Giant School of Music, almost forgot to make it. “Soon after I wrote a second draft, my wife and I had a third child, and in the blur of being outnumbered in the house, I completely forgot about the project,” he says. Enter Greg Tilson, who, in late 2015, hired Middaugh to shoot a music video for his Kingston band, The Gertrudes. After shooting wrapped, Tilson asked if Middaugh had any film projects he wanted to work on together. As a matter of fact, he did, he suddenly remembered, and in early 2016 they got to work, passing the script on to local actors-musicians Anna Sudac (the lead) and Jesse Macmillan (who plays the station manager). Screencap from LIVE in Kingston! And it turned out their partnership worked. After a year of production, lots of challenges and more rewards, the film is set to make its debut in Kingston, and then hopefully make its mark at other festivals across the country. Keep reading for an interview with Jay and Greg on how LIVE in Kingston came together. Why did you guys want to make this film, in particular? Middaugh: As a Kingston musician and filmmaker, this project just combined those two things so perfectly, and then being able to tap into our incredible local music scene, to capture and showcase its talents — it’s an idea exciting enough to sustain a year-long effort. 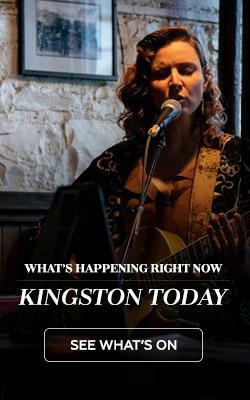 Tilson: Kingston’s so well-known across the country as this intimate, unique music town, and all of the names that have come out of it like the Harmers and The Inbreds and Bedouin Soundclash. But I think there is a need and an interest for people across the country to better understand what’s going on in Kingston’s music scene. And I think we tried to seize that opportunity to try to show the lesser-known stories. What were some of the big challenges during production? Middaugh: I think normally a micro-budget indie movie, especially by a first-time director, would have maybe 10 locations, and maybe 5 actor/performers. This movie has 40 some-odd locations, and with all the bands, maybe 70 individual actors and performers. Coordinating all the people and locations was definitely the most challenging thing. Tilson: All of those details of lining up schedules was so intense. Take a band like Rueben deGroot and the Rocket Surgery Band. That is a huge band, so to get them all to come in to play a song over and over again in The Royal Tavern is just intense. But that’s probably where the uniqueness of Kingston comes in: the bands are so cooperative and helpful to each other to promote the music scene, and the same with the venues. So a lot of the time it would be a super-fun party where the venues are chipping in food and beer and all that. How well do you think the final version of the film captured your initial vision, Jay? Middaugh: We had a production team screening recently, and it’s totally different to watch it with other people and see it through their eyes. I’m so pleased how it turned out — that we pulled off this huge project and made something that I think people will really enjoy watching, while also capturing the music of a remarkable place and time. Once people do get a chance to see LIVE in Kingston, what do you hope they take away from the experience? Middaugh: I hope they see what amazing talent we have in Kingston — musicians and actors. Tilson: I think people might leave with a better appreciation of what a gem the Kingston music scene is and just be a little better informed of our underground stories. There are so many stories in this film, even something like the song that Sarah Harmer performs; it’s an old tune by Dave Hodge, who was in a band called the Hellbillys and was one of her mentors before The Hip. So I think that documenting these stories will just help people better understand how great Kingston is and just have a better knowledge of what it’s made up of. Visit liveinkingston.com for trailers, the full cast and crew, and who helped sponsor the film.